Vince Keenan: Extra, Extra! Noir City! Over the weekend, the Summer 2016 issue of the Film Noir Foundation’s house rag hit in-boxes. And I’ll tell you right now, I’ve never been prouder of any edition of this magazine. The reason is the cover story, my interview with Academy Award nominated director Stephen Frears. Why start with Stephen Frears? Three reasons. He has unassailable credentials, with The Hit (1984) and The Grifters (1990) enshrined in the neo-noir pantheon. He had a new film in release, which in purely practical terms meant he’d be more likely to be accessible. Incidentally, that new film, Florence Foster Jenkins, is delightful. Meryl Streep is understandably the focus of all the attention, but it also boasts the best performance of Hugh Grant’s career. But my main motive was personal. Frears is one of my favorite filmmakers, his name on a movie a guaranteed incentive for me to watch it. I’ve lost track of the number of times I’ve seen The Snapper (1993), while High Fidelity (2000) is a kind of touchstone for me. If I were drafting one of those best-films-of-the-21st-century-so-far lists for the BBC, 2002’s Dirty Pretty Things would most definitely be on it. Somehow, the stars aligned and I found myself on the phone with the man himself. Frears seemed amused at the prospect of being viewed as a noir filmmaker and agreed to stroll down Memory Lane with me, reminiscing about his debut feature Gumshoe (1971) and chiding me about not thinking of Dangerous Liaisons (1988) as film noir. He answered my questions with the low-key, self-effacing humor that seems the exclusive province of the English. Eddie then took things to the next level by announcing Frears as the recipient of the Film Noir Foundation’s first annual Modern Master Award, “given to an artist whose work has displayed an appreciation for the thematic and artistic traditions of classic noir, as well as an eagerness to extend those traditions in fresh and unexpected directions.” Our plan is to present the award to Frears in person at the Noir City film festival in either San Francisco or Los Angeles – provided he can tear himself away from his latest project. And we’re already discussing who the next recipient might be. But that’s only scratching the surface of what’s in this issue. There’s Eddie’s spellbinding article on the making of The Murderers Are Among Us (1946), the first of the “rubble films” shot amidst the ruins of post-war Europe. Imogen Sara Smith offers a pair of related articles on British World War II noir and an appreciation of Carol Reed’s neglected The Man Between (1953). Jake Hinkson considers the career of Detour author Martin Goldsmith. Steve Kronenberg salutes the great cinematographer Nicholas Musuraca. Nigel Collins, longtime editor of boxing magazine The Ring, serves up a surprising list of his 5 favorite noir titles. And the inimitable Johnny Shaw takes us on a tour of South Korean crime cinema, specifically The Yellow Sea. Plus there’s the usual bounty of news, reviews and features, including my Cocktails & Crime column and my take on four films that screened at the Seattle International Film Festival. All of it beautifully laid out by ace designer Michael Kronenberg. 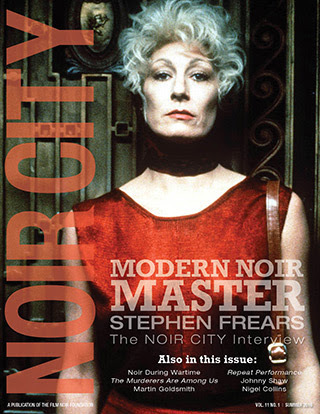 To get your copy, donate to the Film Noir Foundation. You’ll also be entered into a contest to win the brand new Kino-Lorber Blu-rays of Deadline U.S.A. and 99 River Street, with commentary tracks by Eddie Muller, and the Warner Archive DVD of James Ellroy favorite Stakeout on Dope Street. If you want a taste of what’s in the magazine, my piece from last issue on Tequila Sunrise, a movie that had way too much influence on me, is now on the FNF website.